Thomas Flinn is the oldest remaining hand saw manufacturer in Sheffield and continues today to carry on the great tradition of Sheffield saws. The PAX line is Thomas Flinn's top-of-the-line range line. We offer the PAX line with two different handle styles. The Best Things has its own exclusive range of PAX saws with upgraded hand-finished walnut handles, which are both comfortable and attractive. The standard PAX line handles, while not as attractive as our walnut handles, are actually quite comfortable, and offer great value for money. All of the Thomas Flynn PAX saw blades are made from the finest Sheffield saw steel. We used to also offer three different lines of very expensive "boutique" saws. All three of these were very good saws, but none were better than the PAX saws, despite being much more expensive. The handles had more hand finishing work on them, that is true, but the blades themselves were no better, and often not as good. In addition, two of the three of those lines, were assembled by gluing the blade into the back, rather than crimping it in the traditional way. The glued back can be kinked more easily and is much harder to straighten since it can't be retensioned. These PAX saws offer the same blades as the standard PAX line, but with an updgraded oil finished walnut handle that is exclusive to The Best Things. LIke all Thomas Flinn PAX line of hand saws, these saws have an alloy Sheffield steel blade with a mirror finish and a high quality folded brass back. They are hand sharpened at the factory and can be re-sharpened hundreds of times for a lifetime of use. 15 TPI - CC SALE! 20 TPI - Rip Cut SALE! 13 TPI - CC SALE! 11 TPI - CC SALE! 13 TPI - Rip Cut SALE! With the advent of power tools, very few traditional panel and rip saws are still made. Thomas Flinn of Sheffield is among the few who still do. Thomas Flinn PAX saws are great performers at a reasonable price. 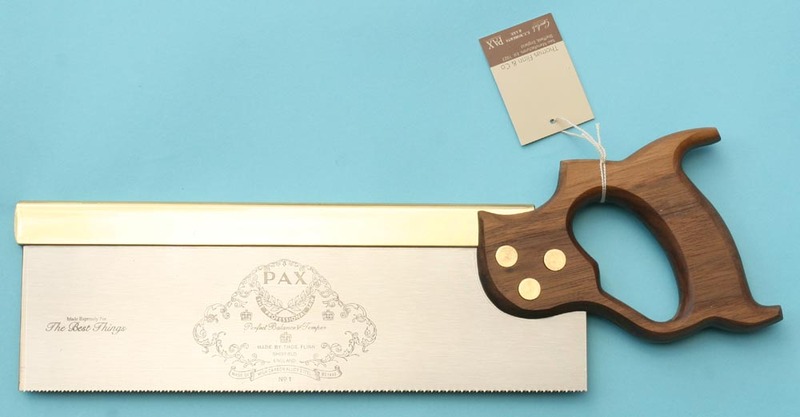 PAX saws are handcrafted from the finest alloy Sheffield steel and are taper ground and breasted (meaning less teeth are in contact with the wood and therefore less friction) and are precisely set and sharpened by hand to ensure the best possible cut without binding. These saws offer a premium quality oil finished walnut handle which will become even more attractive with age and use. 10 TPI - CC SALE!